Last few days were the most scorching summer days here in this season with the temperature soaring higher than 100F. The gymnasium that I visit every day in our locality is facing west direction and hence, in the evening, it turns into a furnace heated by the direct penetration of sunlight. Yesterday just 10 minutes on the treadmill and epillectical cross trainer left me soaked in sweat from top to bottom robbing me of the desire to continue any longer. Nonetheless, ignoring all the jumble feelings about discomfort going around in my head, I persisted my ordeal for exact one and half hour at a stretch with a goal set in my mind to get the lost shape back. Gaining weight is so easy; I wish the reverse would have been easier too. But it seems there is no fast-track route available other than putting your body through a daily grind of work outs simultaneously following a healthy diet. However, I am not in for crash diet. I had tried doing it umpteen times but halfway through I gave up every time. This time I have been following a diet that I would be able to adhere to till I succeed in my mission. Already it is showing results and I am not anywhere near to the verge of drifting away from my goal. I always take heavy lunch in the afternoon up to the satisfaction of my tummy whether or not I am dieting. 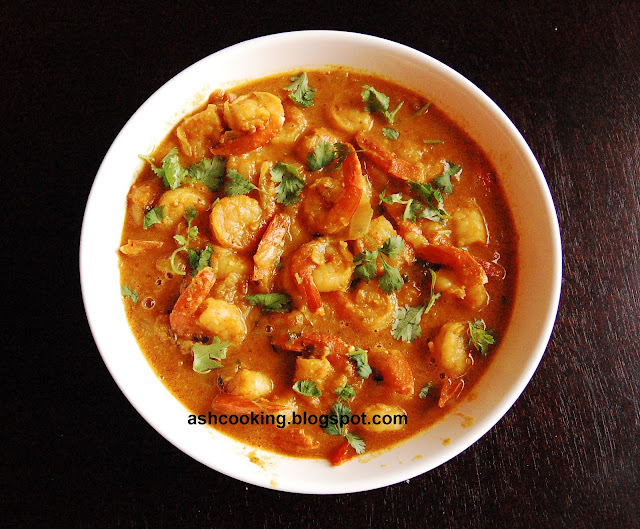 This prawn curry made a sumptuous meal for us and we had it with rice. 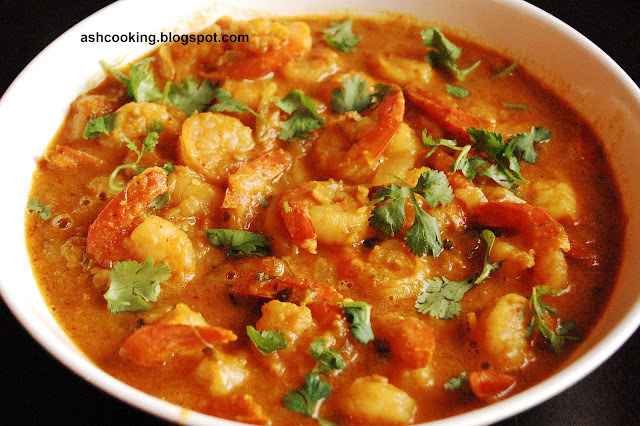 1) Toss the prawns in a pinch of turmeric powder and salt. Then shallow fry them in smoking hot oil. 2) Into the same oil, add dry red chillies and allow them to crackle. 3) Add onion and fry till translucent. Add ginger-garlic paste, green chilli paste and the ground spices - turmeric powder, cumin powder, coriander powder and kashmiri red mirch. Sauté for 2 minutes. 4) Add tomato puree and cook the gravy in making for 2-3 minutes. Add almond paste and little water. Bring the gravy to a boil. 5) Slide in the fried prawns. Add salt and garam masala powder. Cook covered for 2-3 minutes. 6) Add kasuri methi. Gently stir once to mix in. Turn off the flame and keep covered for 5-10 minutes. Let the aroma of kasuri methi permeate the dish. 7) Garnish with coriander leaves. Serve hot with rice or pilaf.